Carson Mastick is entering his senior year of high school and desperate to make his mark, on the reservation and off. A rock band -- and winning Battle of the Bands -- is his best shot. But things keep getting in the way. Small matters like the lack of an actual band, or his brother getting shot by the racist owner of a local restaurant. Maggi Bokoni has just moved back to the reservation with her family. She's dying to stop making the same traditional artwork her family sells to tourists (conceptual stuff is cooler), stop feeling out of place in her new (old) home, and stop being treated like a child. She might like to fall in love for the first time too. Carson and Maggi -- along with their friend Lewis -- will navigate loud protests, even louder music, and first love in this stirring novel about coming together in a world defined by difference. Carson Mastick and Magpie "Maggi" Bokoni are two Native American high school students living on a reservation outside of Niagara Falls. Carson is a senior and has lived there his whole life; Maggi has been a City Indian for seven years, and she's not excited to start her sophomore year in a new school and on the Rez--in a house where her bedroom (shared with her older sister) is an old Airstream trailer attached to the main house by a hole cut in the wall. The only reason she and her sister Marie have a bathroom is because the Airstream has one, and they've promised to take care of it. 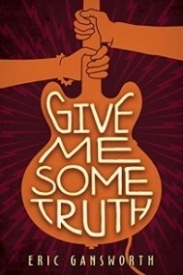 Carson and Maggi are alternating narrators in GIVE ME SOME TRUTH by Eric Gansworth, a novel about growing up on a reservation, dealing with racism, and being a regular teenager/coming of age in the 1980s. Their stories are entwined with those of their siblings, their cousins, their friends, their classmates, their community--and John Lennon, Yoko Ono, and (to a lesser degree) the Beatles. The book is waist-deep in family relationships and drama, but that doesn't overwhelm the focus on high school life, including some romances that feel all-too-real. Carson is very much interested in Maggi, but Maggi only has eyes for her much older, white co-worker. And Maggi's sister has a secret older boyfriend, too. My breakdown of GIVE ME SOME TRUTH is that it has so much Truth in it, it hurts. Carson, Maggi, and the rest of the characters made me laugh, pissed me off, and made me think of my 1980s high school years in equal measure. If I were to detail the themes of the book it would make it sound like the author is all over the place, but the storylines are tight, woven together well, and the writing is great. In fact, I was so invested in the people in the book that I had to put GIVE ME SOME TRUTH down a few times and walk away for a bit because Carson, Maggi, and company were making me angry with their life choices. A special bonus in the book is the artwork by the author. It took me longer to read than I expected, in part because I spent a lot of time staring at the art. That should have a book all its own. Gansworth's first novel, IF I EVER GET OUT OF HERE, has the same setting, and although I haven't read it, I plan to pick it up once my heart mends from reading this one. The kids in the pages of GIVE ME SOME TRUTH have left a mark, and I hope a future book picks up their story so I know where they all end up. I'll worry about them in the meantime. My thanks to YA Books Central and the publisher for a copy of the book in exchange for my honest review.